A synthetic form of the thyroid hormone thyroxine (T4), known as levothyroxine, is the most widely prescribed drug to treat hypothyroidism. If you have been diagnosed with hypothyroidism it means your thyroid is underactive. Your thyroid is either not producing adequate amounts of thyroid hormones or the thyroid hormones are not working effectively in the body. Concerns have recently been raised about the potential hazards of this thyroid drug. 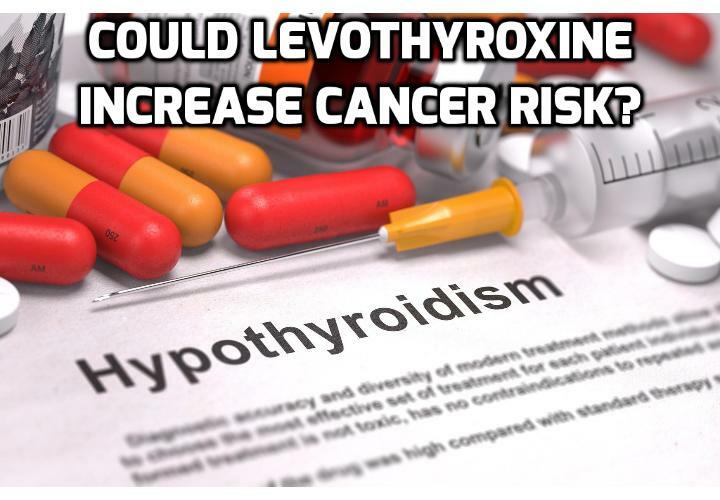 A new Italian study has revealed a significant link between the levothyroxine medication and an increased lung cancer risk. The study titled ‘Levothyroxine and lung cancer in females: the importance of oxidative stress’ was recently published in the Reproductive Biology and Endocrinology journal. The research was carried out exclusively with a population of Italian women as the majority of levothyroxine prescribed in the Italian regions was for women. Reactive oxygen species (ROS) are oxygen derived free radicals. These compounds are continually produced within the body as part of normal ongoing processes. Oxidative stress is a term that refers to the imbalance that occurs when the body’s natural defence systems are overwhelmed by the activity of reactive oxygen species (ROS). Excessive oxidative stress due to over activity of ROS attack can result in the stimulation, and progression of cancer. In this new Italian study the researchers propose the levothyroxine drug induces greater thyroid hormone activity with the potential to generate increased activity of ROS. Due to the rich oxygen state of the lungs, the lung tissue is highly susceptible to damage by ROS. A major trigger for the development of lung cancer is excessive oxidative stress within the lung tissue. The Italian researchers state there are some limitations to their findings. However, this is not the first study to reveal a link between standard hypothyroidism treatment and oxidative stress. A study published in the Journal of the Italian Medical Association Panminerva medica revealed levothyroxine prescribed at a dose of 75 micrograms per day for hypothyroidism caused oxidative stress. Measuring oxidative stress is not normally performed to adjust an individual’s levothyroxine dose. Thyroid stimulating hormone (TSH), thyroxine (T4) and triiodothyronine (T3) are routinely checked to make any necessary adjustments to the medication. Any side effects are considered temporary and are usually dealt with by reducing levothyroxine intake. Increased oxidative stress is not normally considered a factor when there are noticeable adverse side effects. Safer alternatives to levothyroxine medication? The new Italian research also raises important questions regarding alternative thyroid medications. One of the main drawbacks of giving T4 in isolation is that the T4 may not convert sufficiently to T3. This can lead to T4 ‘backing up’ and causing excessive T4 activity. This can easily occur when zinc and selenium levels are low in the body as these two minerals assist conversion of T4 to T3 to meet the body’s ongoing demand for T3. Low T4 to T3 conversion also occurs in response to cutting calories, toxicity and stress. The researchers propose combination T4/T3 therapy or single T3 preparations may be safer options to treat hypothyroidism. There is no doubt smoking dramatically increases lung cancer risk. Smoking was recognised as a stand-alone risk for this new Italian study so smoking risk was adjusted for. Despite this, the relationship between levothyroxine and lung cancer was still significant. Their research also showed smoking and levothyroxine therapy did increase lung cancer risk more than ageing. This study raises serious concerns for women who take levothyroxine and smoke. Should a warning become mandatory to notify individuals that taking thyroxine and continuing to smoke can significantly increase lung cancer risk? If you want to read more there is an excellent blog post regarding this new levothyroxine drug study at GreenMed Info. Previous PostPrevious Which Hormone Controls Thyroid Hormones Production? Next PostNext Why Soy Should Be Avoided in a Thyroid Diet?